We analyze noise-induced phenomena in nonlinear dynamical systems near a subcritical Hopf bifurcation. We investigate qualitative changes of probability distributions (stochastic bifurcations), coherence resonance, and stochastic synchronization. These effects are studied in dynamical systems for which a subcritical Hopf bifurcation occurs. We perform analytical calculations, numerical simulations and experiments on an electronic circuit. 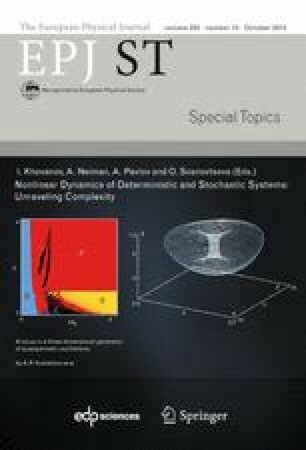 For the generalized Van der Pol model we uncover the similarities between the behavior of a self-sustained oscillator characterized by a subcritical Hopf bifurcation and an excitable system. The analogy is manifested through coherence resonance and stochastic synchronization. In particular, we show both experimentally and numerically that stochastic oscillations that appear due to noise in a system with hard excitation, can be partially synchronized even outside the oscillatory regime of the deterministic system.